This is Winkleigh cycle path, running from the sports centre back to the village and much used by dog walkers, kids going to the play park, and of course Maggie and Euan cycling from Wheatland Farm to school and back. It was relatively new when we first moved to Winkleigh, about 10 years ago, but the grass has been growing over it slowly ever since. We’d been looking at it for ages and wondering how wide it really ought to be, and whether it would be worth making an exploratory cut back to find the edge. So when we saw Andrew Ware, a parish councillor, getting stuck in with a shovel, it was time to join in. It took four of us a couple of mornings and now you could drive a coach and horses down it. A great improvement! 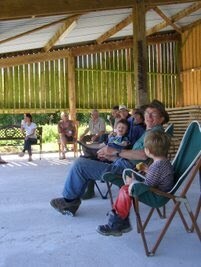 On Friday the Winkleigh ‘Green group’ came for an evening wander around the farm. It’s an informal set up where anyone can drop by, and about 12 people turned up. We took a walk around and explained how we manage the land for wildlife rather than food, and how the holiday accommodation finances that, then all sat around for a bowl of soup and a chat. Summer flowers are coming out, and we found one heath spotted orchid, but not carpets of them yet! You helped us raise £280 for the Devon Wildlife Trust. Thanks. This cheque is in the post to the Devon Wildlife Trust – and it’s come from all our guests. Many thanks. When you book we let you know that if you pay the balance of your holiday cost by BACS we will give £5 to the Devon Wildlife Trust. And lots of you do. So you can be sure that you’re not just helping look after the wildlife on our 21 acre smallholding, but also contributing to wider conservation work in Devon. And for us, it’s a way to say thanks to the Trust, whose staff have given us help and advice over the past ten years. Wednesday and Thursday were the dates for this year’s West Country Tourism Conference, in Exeter. Maggie was invited to talk about sustainable tourism. We often hear the argument that 20% of the holidaying public have extra access needs, and tourism should adapt to that. It’s true. But we went one further and pitched the idea that 100% of visitors have sustainability needs and that, rather than see this as a insurmountable challenge, it is an opportunity for every tourism business. ‘A shade of green to suit everyone’. Big or small, upmarket or budget, everyone can do something. Here are the slides for anyone interested. 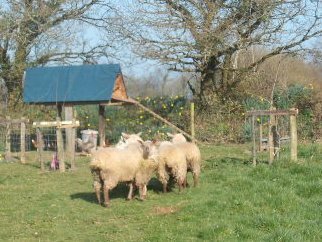 Our new mowers have arrived for the orchard, recently planted with traditional Devon apple varieties. 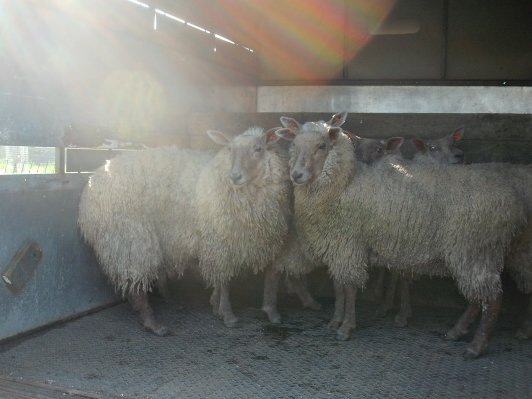 The sheep arrive. They’re used to chickens but the chickens are not used to them! Andrew and Fiona delivering the new mowers from the production line half a mile down the road. I’m not that happy chatting – I’d rather write. But I got asked to do a few minutes on BBC radio Devon (Sat 19 March, Good Morning Devon) on the Get Wild About Devon scheme. And of course I couldn’t say no… What was it all about? The scheme provided an experienced naturalist who walks round the property with you, pointing out wildlife you can highlight to your guests. That information got put into a map and PDF file for web/print out so you can give it to guests and use it in your marketing. We’ll be putting ours in our accommodation and on our website. The idea is to help businesses see the economic potential in their local wildlife (and hopefully so to cherish it). … so I had to get up quietly and hope the kids didn’t come storming downstairs in the middle. It went fine I think (no, I haven’t played it back online) but I don’t think we really empowered people to do much as a result. The scheme was a pilot and seems likely to remain so, given current financial contraints, unless another grant can be found. But there’s nothing to stop people doing it for themselves. Try your county wildlife trust for advice, your local Farming and Wildlife Advisory Group (FWAG), a naturalist group sourced through your county wildlife recorder (again – ask your county wildlife trust). Or if you’re in Devon just look up the list of participants on Visit Devon, find the business nearest you, and give them a ring. I’m sure they’d be happy to tell you more about what worked for them and how you could make something similar work for you. Meanwhile, here’s a picture of our wildlife today – a dunnock’s nest in pendulous sedge spotted when the bird exploded out nearly from under my pruning shears. She was back within a few minutes. We’ll be keeing an eye on the nest and trying to minimise disturbance. A friend and I have been meaning to get together for a drink and to ‘talk green’ since the chutney swap last October. Well this week we got things underway at the village pub. And encouragingly 14 people turned up. That’s not bad for a start. We had a Parish Councillor, the ex head of communications at the Natural Environment Research Council, and people interested in everything from low energy homes and transport to plants on verges, the wildlife of local ponds, and all sorts more. Oh yes, and the bloke who’s doing the lighting in Westminster Abbey for this year’s royal wedding was there. You just don’t know who you live near until you start asking! Well, it’s deliberately not a new organisation, just a social opportunity that we hope will help people share knowledge and build their enthusiasm for all things sustainable. We’ve started with a posterous group where people can chat and we’ll see how it goes from here. Already people are exchanging excess garden plants! [Maggie] I’ve been helping with Winkleigh’s contribution to the 10:10 global work party, organised by 350.org. We had a jam and chutney swap, both online and at the village mini market this Wednesday (13 October). The idea was to highlight the carbon in our food – which makes up 25-30% of the UK’s contribution to climate-altering carbon, depending who’s counting and how. I have to say Kim (pictured) did most of the work! Thanks for coming everyone. Next year maybe we’ll be able to organise something even bigger – a gluttony cook up? A glut stop swop shop? Pipex won this year’s Devon Federation of Small Businesses Environmental Responsibiliy Award but we still got to go and get our finalists’ certificate. It was a bit of a posh do – Ian had to dig out the black tie thing. I had to find a dress – haven’t worn one these last 10 years. It was fun – a night out in Torquay. We met the team from Pipex – a much much bigger outfit than us and producing plastic fittings – so working in a field where you have to carve out a green niche. They’ve done a lot and were worthy winners. Now I’ve got nothing against South Devon, or Torquay for that matter, but I have to say one of the best things about the night was coming back home and leaving suburbia and B&Qs and mini round abouts far behind. The may blossom is festooning the hedgerows, the foxgloves are out, the chickens are around the door and the clover is flowering on the ‘lawn’. I shan’t miss corporate life even if it’s another 10 years before I wear a dress again. [Maggie] On Saturday we hosted a walk for the Winkleigh Society. It was a follow up to my wesbite project, Winkleigh Places, back in April. Of course, Popehouse Moor is my most treasured place near Winkleigh, and it was lovely to be able to share it with other local people who don’t normally get a chance to see it. It was just a shame that the orchids aren’t out yet. I have to say that one of the best bits was actually when we got back – and sampled Marie Claude’s cakes and a much needed cup of tea. Ian had put chairs out in the new lodge, as yet without it’s walls but that just enhanced the view. The lodge itself doesnt look much, but it’s only just ‘out of the ground’. That’s Mike Moser’s wood in the background ready to become very local and sustainable stud walls. Every body got a chance to chat and it was a glorious sunny afternoon. …The others are the Dartmoor Chilli Farm at Ashburton, Pipex Ltd, and Schooling Building Contractors Ltd. Having had a quick look at the competition I’m impressed! Don’t think we’ll be writing our acceptance speech just yet, but hopefully come the awards ceremony (4 June) we’ll at least get to meet some like-minded and interesting people, whether or not we win. Ian has been helping rebuild the website for the Instrumented hive project, based in in North Devon. It’s a group of enthusiastic and experienced bee keepers with a special interest in electronics! The group organises beekeeping courses, hosts regular bee-keeping meetings, and is particularly interested in studying bees in ‘instrumented hives’. The IHP hopes to unravel some of the intracacies of bees, such as the sounds and comb vibrations (particularly as pre-swarm indicators), how comb structure varies in feral or near-feral situations, how to control varroa mites with a biotech rather than a bio-chemical approach. If you’re interested to know more, check out the Instrumented Hive Project website! After long battles, Winkleigh has persuaded the council to ‘give’ it the community centre, previously earmarked for development. But now the money needs to be raised to do repairs and maintenance. Ian helps out on the fund raising committee, and the hedgelaying demonstration we held recently was in aid of the centre. This time we’ve been out collecting contributions to the 50:50 auction and shifting tables for the event back and forth from the sports centre. The van is so versatile. Seats in, you can drive 6 kids to school. Seats out, you can load it right up. …But we were just the hosts. Many thanks to Tom Hynes, of the North Devon Coast and Countryside Service, who provided the expertise, and Maire Claude, Margery and Claire who did the catering. About 20 people turned up – not crowds. But it made a good number at the hedge where Tom demonstrated how to steep hazel, cutting through the uprights and bending them over, but leaving a hinge to living wood to sustain next year’s growth and fastening the whole thing with a crook. [Maggie] On Friday I took a group from the Tiverton branch of the University of the Third Age around Popehouse Moor, our SSSI nature reserve. Initially there were going to be twelve people, which is about as many as we can take at a time, but the pouring rain of the early morning slimmed that down to five. Yet the weather was kind – clearing up to a sunny morning. We don’t charge for walks and always offer free guided walks to guests at our eco lodges and cottage, but we do ask for a donation, to be passed on to the Devon Wildlife Trust, for outside groups. So a big thank you to the U3A group, whose whip round generated £35, which I know the Trust will put to good use. If anyone else would like to arrange a walk, please feel free to get in touch. There’s something to be seen all year round – though May is probably the highlight for flowers. The panels mean Honeysuckle Nuthatch and Beech Lodges all their hot water from solar panels (with immersion top up). Honeysuckle and Nuthatch Lodges have a single west facing panel each. Our large Beech Lodge has two – one on each of the east and west facing slopes. The control system (all part of the kit) chooses which is producing the hottest water and switches the pump to that panel on. The shower in Beech Lodge is still electric, but this will be switched in autumn 09. We also plan solar panels for Otter Cottage [update – done now]. The delay, though not ideal, also means we’ll have more time to gather comparative data – so we should be able to report back later on the economics and pay back times. Meanwhile, we’ve been really impressed with how good the panels are. We ended up doing the installation ourselves (well, Ian did it and Maggie made the tea). We were eligible for a grant from Renewable Energy for Devon (RE4D), but we would have had to use one of their recognised installers, and that pushed the price up much higher than the grant was worth – so we went DIY. So to spread the word, here’s some of what we’ve learnt. 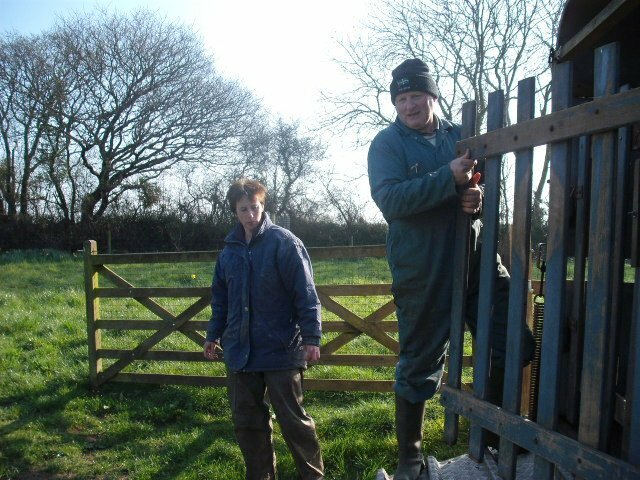 If you’ve got other questions, gives Ian a ring or email us at info@wheatlandfarm.co.uk. Evacuated tube solar collectors are said to be the most efficient at converting solar energy to heat water. Navitron came top in my list of suppliers for their no-nonsense approach and competitive prices, so I went with their kits. I bought the Solarkit1 comprising a 20 tube solar collector, a 175l thermal store (hot water tank), the TDC3 controller, an expansion tank, the circulation pump and extras such as the anti-freeze, the filling pump and some valves. Extras you will need to buy: This amounts to more than you first think. It is essentially the copper pipes to connect up the water in and out, the solar circuit and the expansion tank. You also need drain valves, immersion heater element and a blank cover for the alternative immersion heater hole. However, when you try and squeeze this into an airing cupboard in a way that allows you to then get the tank in and cater for the possibility of one day taking it out again, you find you need a lot of copper elbows, compression fittings, reducers from 22mm to 15mm and so on. Plan it as best you can before starting or you will be up and down to the plumbers merchant (Screwfix is handy for next day delivery) throughout the job. Getting started… I won’t repeat anything on the instructions – they are clear and easy to follow. These are just a few observations from my 3 installs that might make life easier. When you get the Navitron kit (or any other)the most exciting part is the Solar collector or solar panel. By all means have a look at it, but remember that it is really the last thing to install and the easiest part. 2 – the hot water from the taps never stands around in a tank, so there is no legionnaires risk. Mainly of relevance to us as a commercial establishment where steps have otherwise to be taken to avoid this problem. 1/ Do what you can on the ground. Make the frame up and be sure that it is square (measure the diagonals) before tightening up. It is important or the tubes will not lie straight and you will struggle to fit them at an angle – glass does not like being bent! 2/ Loosely fit all the jubilee clips to the bottom of the frame. Easier now than on the roof. 3/ Make sure all the rubber boots for the tubes have holes in the end. They often are not quite punched out in manufacturing, so poke a screwdriver through them or they will not slide onto the tubes properly. Wet the end of the tube to make it easier. The frame is now ready to take up on the roof, and the tubes with boots on ready to be passed up. Today they had a volunteers’ day pulling the stuff up by the roots and loading it onto a tractor. The trust have helped us a lot with advice about our culm grassland sssi, so we like to turn up and help them out sometimes too. Himalayan Balsam is a pretty flower, also sometimes called ‘policeman’s helmet’ because of it’s shape. But it’s invasive and grows in vast stands over 6ft high that shade out everything else. It’s not native to Britain – it was introduced in 1839. It has explosive seeds that can shoot themselves up to 7m away, and it loves damp soil so it spreads along the banks of rivers. Perhaps it’s saving grace is that it’s easy to pull up – it seems odd that such a giant plant can have such a feeble root system – but then if it falls over it just roots again from the leaf nodes. So controlling it is an ongoing battle that has to be fought pretty much every year once the plant has got a foothold. 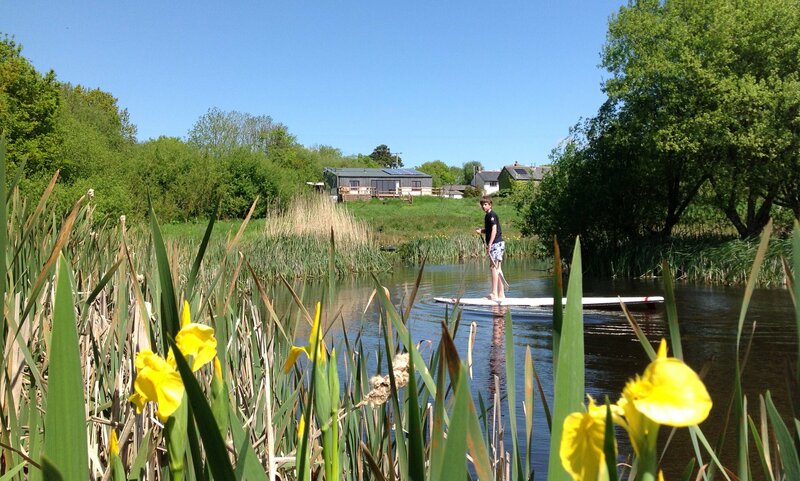 Still, it was a beautiful day to be out there…. Today the reception class from Winkleigh Primary School came, on a combined visit to Higher Punchardon Farm. Hopefully the children will come back again soon and explore more of our wildlife.